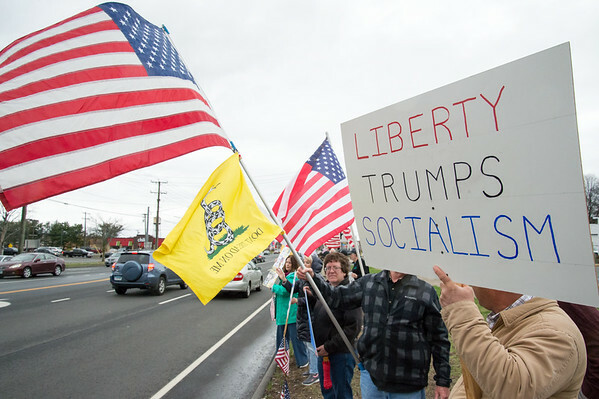 SOUTHINGTON - Area Tea Party activists protested taxes, tolls and socialism Monday in front of Denny’s and Starbucks on Queen Street. Despite drizzle, close to two dozen activists held up handmade signs and waved U.S. and “Don’t Tread on Me” flags to passing cars who honked in support. The Tax Day protest was part of a national effort by the group, with an organizer who chose to remain anonymous saying that similar demonstrations were taking place in 200 to 300 communities across the country. The group, which rose to prominence in opposition to the policies of the Obama presidency, stands for Taxed Enough Already, and is a reference to the Boston Tea Party protest against British taxation. Dave Kimmel, of Southington, spoke against the tolls. He said they are just another tax. 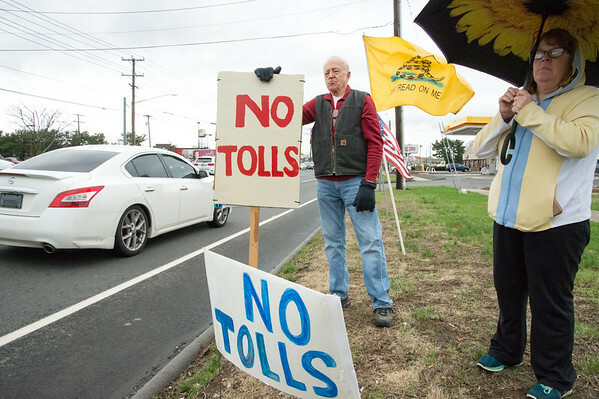 Jane Bate, who wore a No Tolls hat and held a sign saying “socialism takes its toll,” argued that government had overstepped its bounds. She opposed several of the new taxes proposed by Gov. Ned Lamont. “How much is enough to take from one person to give to another?” she asked. “If the governor could tax the air we breathe he’d do it,” she said. Tucker Deming, from Chesire, wore a Make America Great Again hat and held a huge flag in one hand and a pole with multiple signs on it in the other. The signs urged passers by to honk in support of capitalism and a southern border wall. Posted in The Bristol Press, Southington Herald on Monday, 15 April 2019 21:25. Updated: Tuesday, 16 April 2019 12:51.